Trinity Properties selected Chandra Cerrito / Art Advisors to lead the public art program at Trinity Place, a multi-phase, 4 tower residential and retail development that would help transform the struggling Mid-Market area of San Francisco and bring much needed housing to the city’s Civic Center. We worked closely with Trinity’s owner/founder and numerous staff, building architects and landscape architects to define the overall vision for art and identify the artist who could take that vision to a reality beyond expectations. CC/AA led the successful city review and approval process and managed the extensive and critical coordination required among the artist, architects, engineers, contractors, and lighting designers to realize a highly complex and challenging project. C’era Una Volta (“Once Upon a Time”) is one of the final and most monumental artworks created by internationally recognized artist Lawrence Argent (1957-2017). 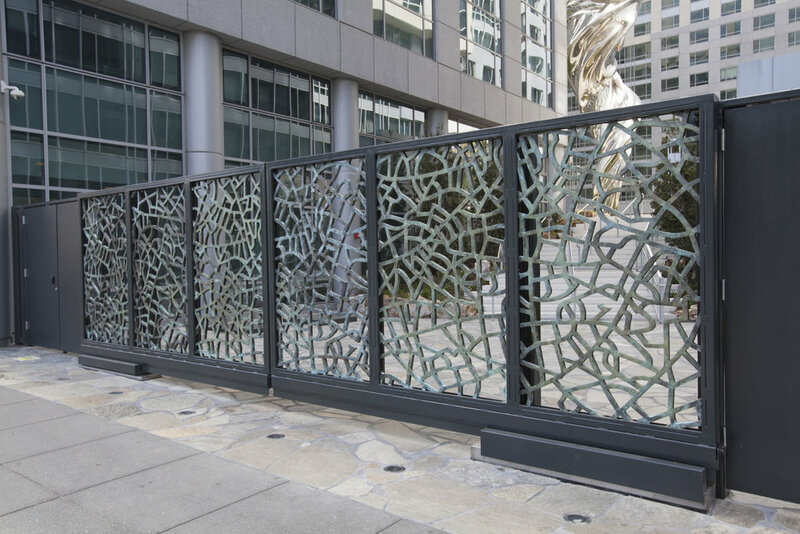 The artwork’s multiple elements are integrated throughout the central courtyard of four residential and retail high-rise buildings in downtown San Francisco. Large-scale sculptures in stainless steel, stone, and glass, unique paving designs, and a custom gate are woven throughout the site, transforming it into a place of engaging mystery and unfolding meaning. Inspired by classical icons of beauty and the stone quarries from which these ancient sculptures were made, C’era Una Volta re-envisions and abstracts classical forms using contemporary digital technologies. A 92-foot tall polished stainless steel sculpture at the center of the courtyard is a whirling abstraction of the infamous Venus de Milo statue. A Carrara marble community table with sculpted folds references drapery of ancient artworks. Stone mosaic and paving artworks play with visual perspective, one of the prime interests of classical and Renaissance artists. 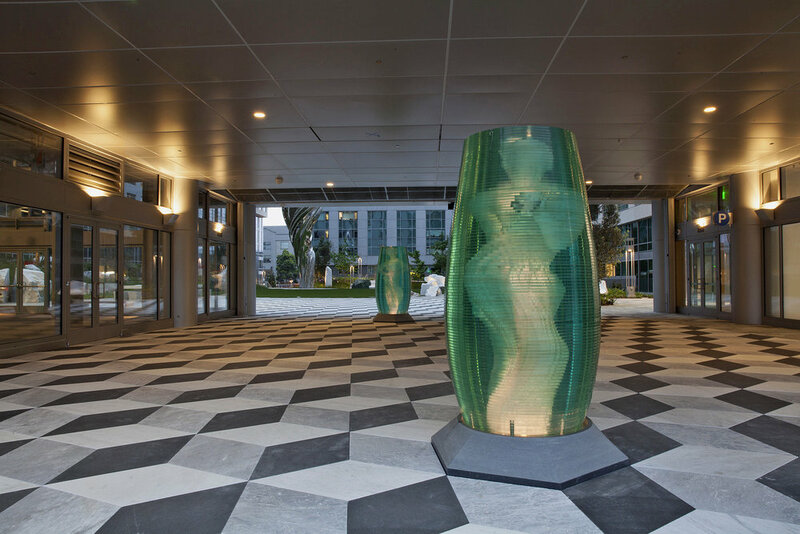 Abstracted neoclassical figures appear within six 8-foot tall illuminated glass sculptures leading to the courtyard. 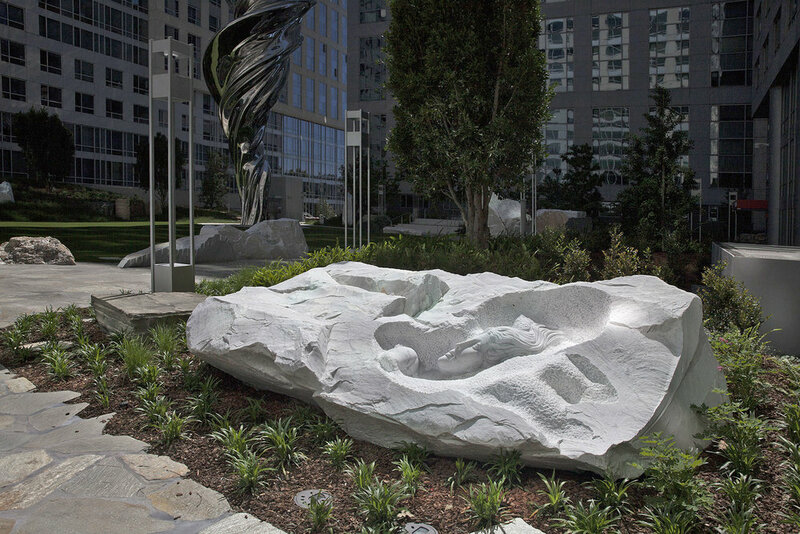 Fragments of sculpted figures are revealed in eight carved marble blocks distributed among 42 boulders scattered throughout the gardens, evoking the remains of an ancient quarry. The pattern of a custom bronze gate enclosing the space is derived from the street map of Genoa, Italy, the beloved ancestral home of the development’s founder. As Lawrence intended, this is an artwork that is more than a series of objects. Not only is it inseparable from its surrounding site, but it also invites immersive engagement. It can only be fully experienced by wandering throughout the entire space. Some elements are perceived quickly, while others reveal themselves slowly. Eventually one realizes all the elements come together to create, as Lawrence described, a gestalt – a wondrous and magical whole. C’era Una Volta surpassed Trinity Properties’ expectations by transforming their development into a truly unique destination, providing an inspiring beacon in the heart of San Francisco, and offering a lasting gift to the city. It is not only one of Lawrence Argent’s most significant public works, but it also culminates the legacy of Trinity’s founder, Angelo Sangiacomo, who passed prior to the artwork’s complete installation. Chandra Cerrito / Art Advisors has been asked by Trinity Properties to continue working with the developer and studio of Lawrence Argent to complete the design, fabrication, delivery, and installation of C’era Una Volta’s remaining artwork elements, which will be installed as part of the last construction phase of Trinity Place. We are honored to be able to help realize the works that Lawrence envisioned.